In this survey, the initial insights on the sub- and transcellular process of oncoprotein metastasis (OPM) are linked to recent observations and advances in related fields. The six proteins described here, i.e. insulin, osteopontin, interleukin-6, anterior gradient-2 protein, cellular apoptosis susceptibility protein and hepatoma-derived growth factor, as well as distinct peptide fragments thereof might henceforth serve as pivotal biomarkers for OPM in clinical chemistry, molecular morphology, pathology and oncology and, as a result, guide as potential targets future structure-based interventions in cancer treatment. Despite thousands of studies about colorectal cancer (CRC) as much as extensively usage of prognostic antibodies/genes and clinical trials that include the newest targeted drugs, this tumor still remains in the top of both incidence and cancer-related mortality. In this review, we intended to correlate our experience in field of colorectal cancer with the literature data and to present our vision about the prognostic and predictive role of some of the most used molecular and immunohistochemical examinations in the field. The prognostic and predictive values of parameters such as microsatellite instability, angiogenesis, Maspin gene/protein, K-ras and BRAF mutations are discussed in relationship to the classical antibodies such as Keratin 7/20, p53 or HER2. At the end, we correlated these informations and tried to realize a molecular classification of colorectal cancer, similar to breast carcinomas, in order to establish targeted groups of patients for targeted therapy. The acute clinical effect of UVR on the eye is photokeratitis, which is an inflammatory state that might be regarded as the sunburn of the eye. In this study, we used a rat model to assess the histological injuries induced in the intact rat cornea following its exposure to UVB radiation. A total of 15 two-months-old female Wistar rats were purchased from the Animal Facility of "Iuliu Hatieganu" University of Medicine and Pharmacy, Cluj-Napoca, Romania. The rats were fed ad libitum and kept under standard conditions with a 12 hours light/dark cycle. The rats were randomly divided into five groups, including control group (no UVB exposure), group II (a single exposure to a dose of 45 mJ UVB/cm(2) for 47 seconds), group III (a single exposure to 90 mJ UVB/cm(2) for one minute and 57 seconds), group IV (a single exposure to 180 mJ UVB/cm(2) for three minutes and 57 seconds), and group V (a single exposure to 360 mJ UVB/cm(2) for five minutes and 26 seconds). After 24 hours of recovery, the rats were sacrificed by cervical dislocation. The rat eyes were extracted, harvested and fixed in 10% buffered formalin. The eye samples were then processed through paraffin technique for further histological examination. We found that, following the UVB exposure, the cornea showed significant inflammatory responses (infiltration of polymorphonuclear leukocytes), hemorrhage and gross damages such as superficial and deep ulcerous keratitis and epithelial exfoliation. The severity of these findings was associated with the increase of UVB radiation intensity and exposure period. The success of surgical approaches to ingrown toenails depends on the extraction (either partial or total) of the nail matrix. The identification of the nail matrix in specimens taken from ingrown toenails is not always easy because of the fragmentation of the biopsies, difficulties in matrix orientations and the heavy inflammatory infiltrate. In biopsies taken from polydactyly surgeries, the matrix shows a peculiar pattern of expression of the CD10 and CD34 markers that differs from the one shown by the lateral nail fold. We investigated whether such a pattern was also found in biopsies from ingrown toenails, which can be greatly distorted through inflammation and fibrosis. We examined 15 biopsies from cases of ingrown toenails at different clinical stages. We performed routine Hematoxylin-Eosin studies, as well as immunohistochemical studies with CD10, CD34, HMB-45 and Melan-A. The morphologic changes in all cases were typical of those found in ingrown toenails and their intensities correlated with the clinical stages. Matrical keratinization was identified in all of the biopsies. Morphologic features that are compatible with the lateral nail fold were also seen in seven of the 15 biopsies. In five cases, an intermediate area of transition between matrix and lateral nail folds was heavily distorted by inflammatory changes. Melanocytic markers showed scattered intra-epidermal cells in all but one case. HMB-45 and Melan-A were equally good in demonstrating the melanocytic population. We concluded that the expression of CD10 and CD34 in cases of ingrown toenails is preserved and it follows the pattern described in nails from polydactyly. Therefore, both markers can be useful in fragmented specimens taken from surgeries for ingrown toenails, in order to confirm the removal of the nail matrix. Objective: The purpose of the experiment was to determine the degree of biocompatibility of a sealer (RO, laboratory made product) dental material in terms of cytotoxicity and animal tests. Materials and Methods: In the present study, the biological compatibility of eight experimental composite materials was examined by in vitro methods. The bio-composites used for the cytotoxicity test were placed into direct contact with normal human fibroblasts in a cell-culture dish. After fibroblast bioassay was performed, a duplicate sample of biomaterial was placed in each well, and then the fibroblasts were incubated for 48 hours at 37 degrees C and 5% carbon dioxide. Local reactions after the implantation of the material regarding preclinical evaluation have been carried out within the Biobase Laboratory of the "Iuliu Hatieganu" University of Medicine and Pharmacy, Cluj-Napoca, Romania. The biocompatibility was studied using the tolerance test by the subcutaneous and intramuscular implantation of the cured specimens. Results: The sealant C3 scored the highest value to the cell viability. The results of the present study showed that different dental materials had different effects on cells. The resin monomer TEGDMA, present in the sealer's composition, increased the amount of intracellular reactive oxygen species. Resin-based composites are cytotoxic before polymerization and immediately thereafter, whereas already set specimens cause almost no reaction. The test of tolerance showed that the composite materials do not contain any toxic, irritant substances or destructive ones for the living cells or tissues. Conclusions: The tests with experimental composite materials revealed that they are not cytotoxic for the living cells, in all versions of the materials used. All the samples of composite materials have maintained their integrity during the experiment, allowing the testing together with the embedded cells, which proved good viability, so they are suitable for dentistry use. E-cadherins are epithelial morphological stabilizers, performing complex functions as receptors, providers of cellular and tissular structural integrity, and functional interactive mediators. Structural and functional unbalance initiated due to E-cadherin expression loss results in direct effects on carcinogenesis specific biological processes, as cellular invasion and proliferation. We investigated the E-cadherin expression aiming (i) to identify the differences in the molecular subtypes of breast cancer, (ii) to analyze the correlations between E-cadherin and specific clinicopathological and molecular characteristics. The study included 42 cases that were investigated immunohistochemically using a panel of antibodies (ER, PR, Her2/neu, CK5/6, EGFR), which permitted a diagnostic in compliance with the molecular classification, followed by the E-cadherin evaluation. The semi-quantitative assessment of E-cadherin was performed using a scoring system based on the positive cells percentage and the staining intensity. Our results showed, according to the molecular subtypes, a strong positive E-cadherin expression in 26 cases (luminal A subtype - nine cases, luminal B subtype - five cases, HER2 subtype - three cases, basal-like subtype - seven cases, unclassified subtype - two cases), and a weak positive one in 16 cases (luminal A subtype - six cases, luminal B subtype - eight cases, HER2 subtype - one case, basal-like subtype - one case). The statistical analysis revealed significantly statistical differences between E-cadherin and tumoral grade (p=0.0208), histological subtype (p=0.0081), triple negative molecular subtypes and non-triple negative, respectively (p=0.0361). These findings support the potential value of E-cadherin for a supplementary differentiation of molecular subtypes, based on the biological significance of its capacity of expression. Acinic cell carcinoma (ACC) is the third most common epithelial malignancy of the salivary glands in adults, exhibiting a low-grade malignancy that mainly occurs in the parotid gland and at a relatively younger age than other salivary gland tumors. We performed an immunohistochemically study regarding angiogenesis in ACC, by assessing the CD105+ tumor microvessels density and investigating the VEGF and its receptors VEGFR1 and VEGFR2 expression in tumor samples. The results indicated an active angiogenesis in ACC, with the highest CD105-MVD score recorded in the solid variant. This fact was supported by the reactivity of tumor cells and endothelial blood vessel cells for VEGF and its receptors (VEGFR1 and VEGFR2). Thus, we concluded that in ACC do exist autocrine and paracrine VEGF loops implicated in growth and progression of this kind of salivary gland tumors. The presence, position, extent, relationships to neighboring structures and size of the human pyramidal lobe were investigated in 58 human post-mortem specimens in order to determine the variability of this structure. The pyramidal lobe is found in 55.2% of cases as a single conical extension of the thyroid gland. It was present more often in male (53.1%) than in female (46.9%) specimens and located slightly more often on the left side of the midsagittal plane (53.1%). According to the origin and location of its base, we defined five types of pyramidal lobe, with the left-sided types (Types III and IV) being predominant. The pyramidal lobe was 22.6 mm long, 11.2 mm wide and 3.6 mm thick (mean values). The means of all measured parameters were higher in female than in male specimens (pyramidal lobe was 2.3 mm longer, 1.6 mm wider and 0.4 mm thicker in female specimens) but these differences were not significant. In addition, we found that the size of the pyramidal lobe was dependent on the presence of a fibrous or muscular band that may represent a fibrous remnant of the thyroglossal duct or the levator glandulae thyroideae muscle. The pyramidal lobe was four times longer and its base was two and a half times wider and three times thicker when it was associated with this band. We believe that our data can be used to perform safer and more effective partial thyroidectomy in order to preserve thyroid function after surgical treatment. The umbilical cord blood (UCB) is a rich source of hematopoietic and mesenchymal stem cells and it can be used for cellular therapy. This article presents data achieved from 50 cord blood samples (46 in utero, four ex utero). The nucleated cells were isolated from the cord blood using a dextran solution. The quantity of stem cells having the immunophenotype CD34+, CD45+ and CD90+ was determined, using flow cytometry. The nucleated cells were cultivated in a DMEM (Dulbecco's Modified Eagle Medium) and biochemical and cytogenetic tests was later performed. The authors made a preliminary assessment of possible correlations between the intratumoral vascular density (IVD) and the architectural tumoral patterns described by Gleason. The studied material consisted of samples obtained by transurethral resection from 34 patients diagnosed with prostatic adenocarcinoma. Ten fields, five for dominant and five for secondary identified patterns of each case, with no necrosis were selected randomly from CD34 immunomarked sections using x20 objective. IVD increased with Gleason pattern both for the entire group, but also for "solid" phenotype group of subtypes up to pattern 4, respectively subtype 4B. In "necrotizing" phenotype group of subtypes, IVD had a decreasing trend from the better-differentiated subtypes to the poorest one. These preliminary data showed that the intratumoral vascular network reacts differently to the loss of tumoral differentiation in the two groups of Gleason subtypes suggesting the existence of two different populations of malignant cells. The paper presents a comparative experimental study of flexion-extension movement in normal and osteoarthritic human knee. Measurements were performed on a group of seven healthy subjects and on a group of five patients with OA knees, for which experimental data were acquired for walking cycles on treadmill. Using an electrogoniometer-based acquisition system, the data were collected during the experimental gait on a treadmill with the speed equal to 3.6 km/h. The flexion angle during the gait cycle revealed differences with respect to flexion magnitude between the OA patients and the healthy subjects group. Statistical analysis demonstrated that the knee flexion angles were significantly different for experimental measurements of the OA patients' knees and healthy knees, but, also, the healthy knees of the patients were on average less flexed than gait cycle of the healthy subjects. Dermatoscopy is a non-invasive technique that enables the early diagnosis of melanoma. The purpose of the present study is to identify the dermatoscopic structures or changes that can indicate the presence of thin melanoma and their correlation with the histopathological aspect. Materials and Methods: Twenty-four thin melanomas diagnosed at the Department of Dermatology in Cluj-Napoca, Romania, have been assessed from the point of view of the presence of dermatoscopic structures likely to indicate malignancy. The lesions have been excised and serially sectioned to identify the histopathological correspondent of the various dermatoscopic structures. Results: The dermatoscopic analysis has indicated the following characteristics that suggest the presence of thin melanoma: irregular dots or globules, small white or grey-blue areas, some peripheral pseudopods or radial streaming, red dots at the level of the lesion or the presence of an atypical vascular pattern. As far as lesions under dermatoscopic follow-up are concerned, the following may be signs of malignant transformation: changes of the pigment network, newly appeared small white or red-blue areas or irregularly distributed dots or globules. All these structures are correlated with the histopathological changes that characterize thin melanoma. Conclusions: Slight dermatoscopic changes are extremely important in diagnosing thin melanomas as they correlate with the histopathological aspect. Objective: The purpose of the study was to assess the biocompatibility of a composite material considering the reaction caused at the implant site during 21 days by daily observing the subjects' behavior as well as by macroscopic examination and histological examination upon expiry of the testing period. Materials and Methods: We performed the tolerance test by implant of the composite material Dualcim. The implant test was made on two species of lab animals, Guinea pigs and Wistar rats in two versions: subcutaneous implant and intramuscular/perimuscular implant. Results: After a 21 days period, when the implant was in direct contact with the tissue, no change of the shape and consistency, color or surface of the implant occurred. Around the implants, the biocompatibility was kept under physiological limits. Conclusions: The product, in the structure and shape presented, could be easily placed under good conditions, both at the level of the subcutaneous tissue and at inter-muscular level. In case of both species and in all subjects, the histological exam proved a favorable development of the relationship between the implant body and the placing site. Granuloma annulare (GA) is classified as localized, generalized/disseminated, subcutaneous, and perforating types. The studies show connection with diabetes mellitus, lipidic metabolic disorders, malignant diseases, thyroid disorders, infections (HBV, HCV, HIV). We performed a retrospective study between 2010-2011, regarding disseminated GA (GAD), and the relationship between GAD and other comorbidities. We clinically and histologically diagnosed eight cases of GAD. The patients were also investigated for the diagnosis of associated diseases. The treatment included topical corticosteroids, antihistamines, Calcipotriol/Betamethasone, Tacrolimus 0.03%, Pentoxifylline, Hydroxychloroquine. Therapeutic response was assessed one month and three months after hospitalization. Our patients were five women and three men, aged 46-68 years, mean age 57.25 years, with a disease history of one year and a half (between three months and four years). The lesions occurred in the upper extremities (eight cases), distal extremities (three cases), cervical area (two cases), and trunk (five cases). In seven cases, we found annular appearance and one patient had disseminated small papules eruption. Associated pathology was diabetes mellitus type II (five cases), overweight and obesity (five cases), dyslipidemia (three cases), hypothyroidism (one case), rheumatoid arthritis (one case), external ear canal basal carcinoma (one case). Although there is controversy regarding the relationship between GAD and associated diseases, it is accepted that it is significantly associated with diabetes mellitus, also found in our study in five out of eight cases. We noticed obvious improvements after local and general treatment. It is confirmed that GAD is prevalent in women, over 40-year-old. GAD is often associated with diabetes and dyslipidemia, therefore it is necessary to investigate patients in this direction. The histopathological exam is essential for an accurate confirmation of GA. The aims of this study were to determine the diagnostic accuracy and reproducibility of the laser fluorescence device (LF), and the relationship between laser fluorescence readings taken at the entrance of the fissure, ICDAS visual examination caries detection system and the histological depth of the lesion. Two hundred and forty teeth (122 human third molars and 118 bicuspids) were selected from 62 patients enrolled in the study. Visual and LF examinations (Diagnodent, Kavo, Biberach, Germany) of the occlusal surfaces were performed in vivo. After tooth extraction, histological sections were evaluated by stereomicroscopy in vitro. Statistical analysis was performed using multiple statistical methods (SPSS ver. 17). Intra-examiner reproducibility for the LF measurements was excellent: intra-class-correlation coefficient (ICC) for LF was 0.957. Kappa values for each examiner's reproducibility were 0.74-0.82. The diagnostic performance of the LF device gave a good overall diagnostic accuracy according to ICDAS II codes and histological values as indicated by the area under the ROC curve of 0.707 and 0.709 respectively. The results of the study showed acceptable diagnostic accuracy for the laser fluorescence device. This supports the view that dentists can be site specific in applying fluorescence-based devices to multiple discrete sites within the same surface. In conclusion, these diagnostic methods have different characteristics, indications and limitations for use. In order to detect caries on occlusal surfaces thoroughly, a combination of methods would be the best practice moderated by clinical knowledge and experience. Oral cavity cancer is a public health problem as the sixth leading cause of cancer worldwide. Most tumor lesions are detected in stage III and IV, leading to a poor prognosis, five-year survival rate ranging between 10% and 40%. Oral cancer etiology is multifactorial, known still incomplete. The main etiopathogenic factors are exposure to cigarette smoke and alcohol consumption. We conducted a retrospective study of oral cavity tumors hospitalized in 2008-2012 in Oral and Maxillofacial Surgery Clinic of the Emergency County Hospital of Craiova, Romania. Of 143 tumors of the oral cavity, 125 were malignant, and of these, 115 (92%) were represented by squamous cell carcinoma. Tumor lesions were more common in males (69%), patients from rural areas (64%) and those over 50-year-old (87.71%). The study aimed to the investigation of the toxicity of organophosphorus pesticides malathion (MLT) and diazinon (DZN) in Wistar rats in a repeated dose study for 35 days. MLT and DZN in corn oil vehicle were oral administered. Body and organs weights, plasma and brain cholinesterase activities, serum aspartate aminotransferase (AST) and alanine aminotransferase (ALT) activities, histopathological changes in liver and kidney, and some parameters of the immune function, such as leukocyte formula, spleen weight and cellularity, spleen lymphocytes proliferation in response to concanavalin A (Con A) were investigated; the potential oxidative stress (malondialdehyde in plasma and brain, and blood catalase activity) was also evaluated. No clinical toxicity signs attributed to pesticides were noted; no significant changes in the organ weights have been found. Body weight tends slightly to increase, predominantly in DZN treated rats. The results suggest that plasma cholinesterase is more susceptible than brain cholinesterase to the inhibitory effect of DZN and MLT. Other serum biochemical parameters showed no significant difference. DZN produced a marked increase of the number of spleen lymphocytes without a significant gain of the relative spleen weight. The both pesticides produced an increase of the number of mononuclear cells/weight spleen. The splenic lymphocyte proliferation has not been influenced by MLT or DZN treatment. Histopathological observations identified some changes (vasodilatation, microvacuoles, and granular dystrophy) in the liver, with MLT, inducing macrovacuolar steatosis. The study indicates that repeated exposure, at subclinical doses, to organophosphorus MLT and DZN causes some biochemical, histopathological and immune alterations in rats. The ultrasound mechanism of action in fracture healing is still unknown. The mechanism that controls the compartment of each cell during healing process derives, possibly, from the microenvironment of said cells; studies in the field show differences of 55 to 84% between cross-sectional areas, depending on the sectioning mode. In order to assess the impact of ultrasound application to bone cells, we have examined bone tissue by help of Nikon E-600 microscope; the three-dimensional images have been obtained by Zeiss LSM 510 laser confocal microscope, from the Riken Physico-Chemical Analysis Laboratory, Japan. Morphometry analysis was made by Lucia Computer Program. An increase by 10% in the surface of cavities containing osteocytes has been noticed in the batch stimulated by ultrasound as compared to control batch, with individual values of 21.86 to 98.139 in both batches. The changes that appear in stimulated bone, from both morphometrical point of view and that of osteonal positioning, as compared to normal bone tissue, are the final result of such remodeling, in which the bone did not take its initial form, but the one that could best perform its function. Introduction: In absence of treatment, old single edentulous spaces are subjected to progressively decrease in length due to tilting and rotation of the teeth situated mesial and distal. Lately when these spaces are prosthetically restored with a bridge and these teeth are becoming abutments, sanitizing of the prosthetic restoration is achieved with difficulty, the space between the pontic and the gingival surface becoming an area rich in pathogens that can cause various complications on the abutments. Aim: Considering these aspects, in this study we wanted to highlight the presence and the types of the microorganisms that can be found under the pontic even in an ideal situation, selecting only young adult patients with a good oral hygiene and only with metal-ceramic bridges. Materials and Methods: Determination of microorganisms was achieved by growing on BD Columbia Agar with 5% sheep blood. Incubation was done in anaerobe condition using GENbag system produced by BioMerieux Company. Results: The microorganisms that we determined were Streptococcus mutans, S. mitis, S. oralis, Gram-negative bacilli (Bacteroides ovatus, B. thetaiotaomicron) and Gram-positive bacilli (Bifidobacterium spp., Actinomyces israelii, Clostridium butyricum / beijerinckii) with relevance in the carious and periodontal disease. Conclusions: In cases of single unit bridges with very narrow pontics, even in patients with a very good oral hygiene and metal-ceramic restorations, we can still find micro-organisms that can potentially generate decay or periodontal disease on the abutments, located in the gingival area underneath these pontics. These bacteria can have negative implications on the long-term prognosis of prosthetic restorations. Schizophrenia is recognized as a psychiatric disorder that causes the most pronounced disturbances of cognition and social integration. In the etiopathogenesis of the disease, genetic, neurobiological and vascular factors are involved. Functional integrity of the brain can be correlated with the integrity of the blood-brain barrier (BBB), and the dysfunction of this barrier is an indicator that suggests neurodevelopmental abnormalities, injuries of various etiologies and dysfunctions within the small vessels of the brain that disrupt the calcium homeostasis. Neuroimaging shows that in patients with poor evolution, cognitive dysfunction and therapeutic resistance, the presence of choroid plexus calcification associated with hippocampal, frontal, temporoparietal and cerebellar atrophies. Antipsychotics with high capacity to block D2 dopamine receptors (haloperidol model) can aggravate apoptotic mechanisms of the brain areas involved in cognition and disrupts the functional integrity of the BBB due to decreased of choroid plexus blood flow because of the narrowing of cerebral small vessels. Choroid plexus calcification may be a predictive indicator of poor evolution or of a neurodegenerative type. A large number of publications recognize that there are melanocytic lesions with microscopic features similar to melanoma, related to their location. Those locations are represented by the ear, the milk lines (axillary, breast, periumbilical and inguinal regions), palms, soles, and flexural regions. Starting from Rongioletti F et al. study in 2004, we measured 10 histological parameters on 96 nevi (39 from the breast) and notes with 0 if absent or impossible to evaluate and with 1 if present. The score for each lesion ranged from 0 to 7 and we compared the features of the breast nevi with the nevi from the control sites and found that breast nevi present more atypical features than the nevi from the other sites (absence of demarcation of melanocytes at lateral margins, nests and dyscohesive pattern and melanocytic atypia). We also performed immunohistochemical examination on lesions that presented three or more of the examined histological parameters, but the results were nor suggestive. The conclusion of this study is that the atypical features of the breast nevi are only site related atypias and have no hormonal influences. The prenatal diagnosis is currently widely spread and facilitates the acquiring of important genetic information about the fetus by a rate extremely accelerate and considered without precedent. In this paper, we like to present our experience concerning the genetic diagnosis and counseling offered for pregnancies in which a structural chromosomal aberration was found. The study group is formed by 528 prenatal samples of amniotic fluid and chorionic villi, received by our laboratory from 2006 through October 2012 for cytogenetic diagnosis. The appropriate genetic investigation was selected based on the indications for prenatal diagnosis. The cases with structural chromosomal anomalies and polymorphic variants were analyzed as regard to the maternal age, gestational age, referral indications and type of chromosomal anomaly found. A total number of 21 structural chromosomal anomalies and polymorphic variants were identified in the study group. Out of 21 structural chromosomal anomalies and polymorphic variants, six deletions and microdeletions, four situations with abnormal long "p" arm of acrocentric chromosomes, two duplications, two reciprocal translocations, two inversions, two additions, one Robertsonian translocation associating trisomy 13, one 9q heteromorphism and one complex chromosome rearrangement were noticed. 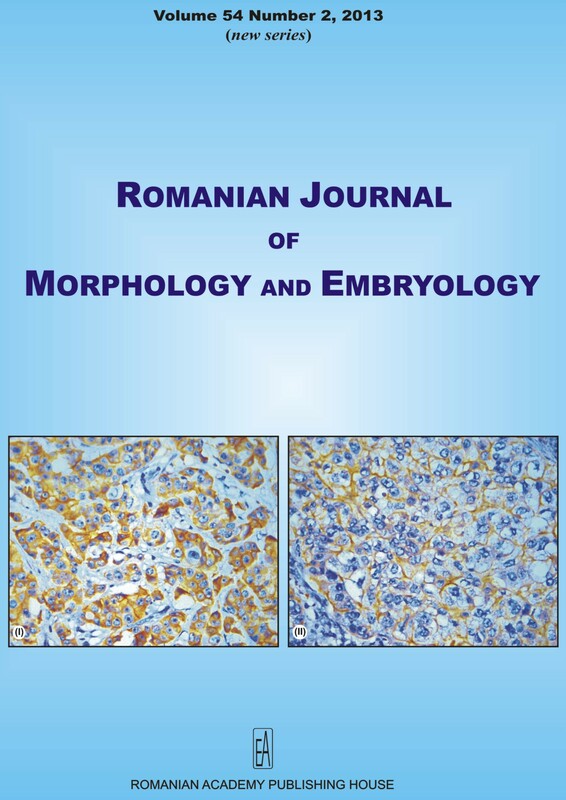 To the best of our knowledge, this is the first Romanian study in which the diagnostic strategies and the management of the prenatal cases with structural rearrangements are presented. The data provided about the diagnosis strategy and the management of the prenatal cases with structural chromosomal anomalies represents a useful tool in genetic counseling of pregnancies diagnosed with rare structural chromosomal anomalies. Clozapine is an atypical antipsychotic. It is the best option in treatment of resistant schizophrenia. It causes many metabolic side effects, including diabetes mellitus. This study aims to detect the histopathological change of the rat pancreas under chronic clozapine treatment. Twenty adult male albino rats were divided into two groups; control; received daily 2 mL tap water by intragastric tube for 21 days, and treated; received instead 25 mg/kg clozapine in 2 mL tap water. Animals were sacrificed and specimens from the pancreatic tails were processed for histopathological and morphometric studies. In treated animals, the islets were large and irregular. Most interlobular and interlobar ducts were dilated and some showed a related area of endocrine-like cells, which was sometimes immunoreactive to the anti-insulin antibody. Masson's trichrome revealed increased interlobular and interacinar collagen fibers. PAS stain revealed an increase in the thickness of the islet capillary basement membrane. Immunohistochemical staining with anti-insulin antibody showed strong staining of the islets of treated animals. Morphometric study revealed a highly significant increase in the number of both islets and interlobular ducts/lobule and in the diameter of both islets and interlobular ducts. It also revealed a highly significant increase in the diameter of the periductal fibrotic area and in the thickness of the islets capillary basement membrane in treated animals. In conclusion, chronic clozapine treatment caused changes in the pancreas similar to those occur in diabetes in the form of islets hyperplasia overlapped by atrophic changes as fibrosis and thickening of islets capillaries. Bone transplantation as a mean to reduce the fracture healing time in large defects was attempted for the first time more than 300 years ago, with nowadays several techniques and methods of assessment of its efficacy. The bone graft was longtime thought as initiating the osteogenesis from the recipient, but new data show that cells from the graft contribute to osteogenesis and to its incorporation into newly formed bone. There is no accurate assessment of the microdensity of bone graft cells in evolution so far, the only studies published recently referring to newly formed bone area. We have performed bone transplantation on seven dogs and have analyzed the microdensity and the morphometric features of bone graft cells. We have found that the cellular microdensity increases both in the graft and in the recipient bone, simultaneously with a decrease of cell size and circularity during maturation. The largest artery in the human body, intimately connected to the heart, aorta is usually regarded as the major source of oxygenated blood for the circulatory system. The three concentric layers, which surround the aortic lumen-the tunics intima, media and adventitia, transform the aorta in a large elastic duct, which is irregular calibrated according to its segments. The special aortic distensibility is facilitated by its elastic circumferential lamellar complex. Any disturbance of its structural components is able to interfere with its normal and vital activity. Our study intends to reveal that the development of elastic lamellae should be regarded not only as an indispensable step for the aortic wall configuration, but also like a process in a firm connection with the rest of aortic wall components. The transition from intrauterine life to a new stage of life, childhood, has to determine an adequate adaptation of almost all the components of aortic wall, in order to sustain a consistent pulsatile blood flow. Stereological quantitative analysis of thoracic aortic fragments prelevated from newborns and children was performed in order to estimate the dynamic of vascular wall increase. We first estimated the general configuration of the thoracic aortic wall, quantifying the principal constituents; the connective tissue profile, investigated through its main elements, collagen and elastic fibers, supports the idea that each type of fiber has a distinct evolution in different groups of ages and has to be correlated with their involvement in maintaining of the aortic wall mechanical properties. Elastic fibers percentage volume was increased in both examined groups, with a small difference reported in children aorta, while collagen fibers exhibit a slow increase in children aorta. Our morphometric quantitative assessment suggests that further studies have to draw of in a precisely manner the outline of the secretory well defined function of vascular smooth muscle cells; the elucidation of the manner in which the secretory pathway for each type of fiber becomes fully adapted to every stage of aortic development will allow a new perspective in aortic pathology. Introduction: Histological abnormalities are common findings in the left atria (LA) of atrial fibrillation (AF) patients. We aimed to assess LA histological abnormalities in our model of spontaneous atrial tachyarrhythmias in rats. Materials and Methods: LA sampling was performed in 12 spontaneously hypertensive rats (SHRs) and eight age-matched Wistar-Kyoto (WKY) rats. Tissue sections were stained with Masson's trichrome and Hematoxylin-Eosin-Safran and examined with a light microscope. A 0 to 3 scoring system was used to quantify the severity of LA structural abnormalities. LA von Willebrand factor (vWF) content was also assessed using immunohistochemical staining. Results: In six of the eight SHRs, LA fibrosis, inflammatory infiltrates, and myocyte necrosis of varying grades of severity were observed. The most frequent feature was endocardial fibrosis, which was observed in six SHRs and in none of the WKY rats. Intra-atrial thrombosis was found in three SHRs and in none of the WKY rats. The intensity of vWF-related fluorescence was higher in the atrial endocardium of SHRs compared to age-matched WKY rats. Conclusions: Our findings reinforce the role of LA structural abnormalities in atrial arrhythmogenicity. However, two SHRs did not present LA histological abnormalities despite the presence of arrhythmias. This finding suggests that the LA remodeling-atrial tachyarrhythmia relationship could be highly nonlinear and that atrial fibrosis is more likely to be a facilitator of atrial arrhythmogenicity, rather than a prerequisite. We also provide evidence that intra-atrial thrombosis accompanies LA structural remodeling in arrhythmic rats. Increased endocardial platelet adhesion molecule vWF could contribute to this increased thrombogenicity. The blue nevus is a variant of a melanocytic nevus that presents as blue-gray to blue or black papules or nodules measuring up to 1 cm in diameter; it has a predilection for females and can be congenital or acquired. The classification of blue nevi is complex, with biological behavior being benign, borderline, or malignant. The case we present is one of a 40-year-old woman with multiple dermatofibromas that appeared and increased gradually in size during pregnancy. Physical examination revealed three spherical, brownish to red-purple nodules localized on the left leg, right shoulder and right laterocervical area. In addition, on her right forearm, there was a 0.3 cm nodule with a discreet non-pigmented, elevated area and a blue perilesional border that appeared in her childhood, affirmative after stinging herself with a pencil. The patient's family history was negative for significant lesions. The laboratory and imagistic findings were normal. Four skin biopsies were performed. The histopathological examination revealed an uncommon blue nevus with two different populations of pigmented cells: spindle shaped or dendritic melanocytes diffuse distributed in the middle dermis and closely aggregated deeply pigmented melanocytes in the reticular dermis. The other three lesions were diagnosed as dermatofibromas: bland spindle shaped cells in a fibrous stroma, some cells with a storiform arrangement. The overlying epidermis was hyperplastic with acanthosis and hyperpigmentation of the basal cell layer. No mitoses were seen. A 15-year-old boy is admitted to the hospital for clinical signs that suggest a pulmonary-renal syndrome (fever, cough, hemopthoic expectoration, oliguria, gross hematuria). A crescentic pANCA positive glomerulonephritis was configured. However, dense subendothelial deposits were identified in electronic microscopy and immunofluorescence staining showed granular deposits of IgG and C3, kappa and lambda in the capillary loops. Although the treatment was strictly followed, after three years and three months of good clinical state, he manifested signs of kidney failure being transplanted. His case represents a specific pattern of rapidly progressive glomerulonephritis leading to kidney failure and emphasizes the importance of clinical attendance especially in a case of two associated glomerulopathies. In the Renaissance (1634), Ambroise Pare described for the first time the omphalocele, highlighting the serious prognosis of this malformation. The incidence of omphalocele varies between 1/2000-1/6000 births, both sexes being equally affected. We present the case of a male infant, born at term after a pregnancy that was not followed by the family doctor or by the specialist obstetrician and who died after five days. On the anterior abdominal wall in the umbilical region, there was a formation of about 10 cm in diameter, covered by a membrane apparently avascular through whose transparency there could be observed a blue-reddish tumor, of discreet firm consistency that while breathing compressed the apparently avascular membrane that covers it. Intraoperative there was noticed liver herniation by parietal defect, operating the liver reintegration in umbilical cavity, subsequently the child dying from a cardio-respiratory arrest. The particularity of this case is on one hand the liver herniation without intestinal loops, the most common liver hernia being with intestinal loops and, on the other hand the presence of hepatic dysmorphism. We also mention the trilaminar structure of omphalocele membrane sac, which makes us think that the herniation was secondary, after the tenth week, through a defect of the anterior abdominal wall closure in the umbilicus region. The combination of these elements creates the uniqueness of this case. In this paper, we present the very rare case of a 21 weeks pregnant woman, examined clinically and by ultrasound. We could observe the present of two heads and a common trunk and therefore we proceeded to the small caesarian of necessity. We examined the fetus from the clinical and pathological point of view and we could observe a rare case of pregnancy with a bicephalous malformed fetus. During the autopsy, we could reveal the common elements and the devised ones, which are described as it follows. The case is a very rare one and that probably explains the fact that until the 21 weeks examination, even if she was clinically and ultrasound examined there was the appreciation that it was a twin pregnancy with a normal evolution. In this case, it is necessary to underline that the difficulties concerning the diagnosis and the medical behavior are also because the patient was a primipara 34-year-old woman without any pathological or specific family history. This case analysis shows the necessity of a preconception genetic advice together with the extension of the analysis of the genetic risk in all mothers under 35-year-old, mandatory and supported by the medical system. At the same time, an ultrasound examination of great performance proves to be necessary in order not to prolong the development of a pathological pregnancy. Giant-cell tumor of the bone is a benign tumor, but with high local aggressiveness, even with risk of distant metastasis. From an epidemiological standpoint, giant-cell tumor of the bone accounts for 4-5% of primary bone tumors and ~20% of benign bone tumors; commonly affects adults between 20-40 years, slightly more common in females. We present the case of a 57-year-old woman, without significant pathological history, which, after clinical, imagistic and anatomopathological investigations, is diagnosed with giant cell tumor of the right distal radius. The patient underwent surgery and segmental resection of the tumor in oncological limits was performed, replacing the remaining bone defect with fibular autograft. The results were good, according to Mayo functional assessment score. This way, the wrist joint mobility and the carpal cartilage were preserved, providing a barrier against distal migration of any remaining tumoral cells, as well. In conclusion, we can state that in aggressive giant cell tumors located at the distal radius, the best therapeutic option is en bloc resection of the formation (lesion) with fibular autograft replacement of the bone defect. Background: This study reports the case of a 14-year-old girl in good state of health who presented with the apical third of the buccal root of the first upper right premolar that penetrated the alveolar buccal plate and overlying mucosa, being exposed to the oral environment. The treatment rationale is presented and compared with other therapeutic options described in the literature. Methods: Endodontic treatment and root end resection in association with a guided tissue regeneration protocol were recommended to preserve the tooth. Results: The evolution was favorable after surgery while the alveolar and mucosal defects were corrected through tissue regeneration and remodeling. A two-year follow-up period with every six months radiographic evaluation was considered. Conclusions: The therapeutic approach gave satisfactory results. The literature describes conservative treatment modalities in cases with mucosal fenestrations affecting permanent teeth. Agenesis of bilateral maxillary canines is very rare and mesiodens is a commonly occurring supernumerary tooth type. Concomitant occurrence of both hypodontia and hyperdontia is extremely rare and it is a condition of mixed numeric variation in the same individual. The reported prevalence of this condition ranges between 0.002% and 3.1%. The purpose of this case report is to describe a rare occurrence of hypo-hyperdontia involving agenesis of both maxillary canines, mesiodens and associated with taurodontism. Background: Intraventricular tumors represent a diagnostic problem, due to a wide range of differential diagnosis, with an important variability of tumoral histological types in adult and pediatric population. Patient, Methods and Results: Our case is represented by a patient, aged 48 years, without any history of significant personal pathology, accusing nausea, vomiting, and intensive headache. In the morning, he became confused, having hallucinations for a short period of time, and has accused drowsiness for several weeks. Imaging (CT and MRI) shows a neoformation in the third ventricle, accompanied by bilateral lateral ventricles dilatation, with predominantly annular enhancement. During surgery, through the middle third transcallosal interhemispheric approach, it was revealed a reddish, well-demarcated intraventricular mass, well vascularized and with a firm consistency. Final pathologic diagnosis was metastatic clear cell renal carcinoma. Initial postoperative evolution was good, and then neurological and respiratory condition worsened as a bronchopneumonia lead to patient's death in 12 days after surgery. Conclusions: Clear cell carcinoma metastasis located in the third ventricle should be taken into consideration for patients presenting a single intraventricular lesion even they have no documented primary malignancy. Retroperitoneum is a large space where the primary and metastatic tumors grow silently before clinical signs appear. Retroperitoneal sarcomas represent 10% to 15% of all soft tissue sarcomas. This group, retroperitoneal soft tissue sarcomas is associated with a very poor long-term survival rate, difficulty in diagnosis and complete surgical removal with a rim of normal tissue around the tumors. Liposarcoma is the most frequent retroperitoneal sarcoma. MFH is the second most common retroperitoneal sarcoma. The diagnosis in retroperitoneal sarcomas is clinical, radiological and histological. Our case presents a MFH with the difficulties of clinical, radiological and histological diagnosis. The initial diagnosis is based on the imaging findings, which offer information on the composition, density, extend and relation to the adjacent organs and structures, with the identification of displacement of the kidney. The definitive diagnosis is established by the pathology findings. The proportion of local recurrence rates of MFH after initial local excision ranges between 16% to 52%.